The Global Polyvinylidene Fluoride (PVDF) Market is one of the rapidly growing Industry with significant number of major players operating in the market. The prominent factors driving growth of this market is the growing demand for the product from major end users such as electrical & electronics, building & construction, and pharmaceuticals. Collaborations and strategic alliances between market players and high performance properties of PVDF, which are useful in number of emerging industries such as new energy and electronics is projected to fuel the demand for the product during the forecast period. Players in this market adopted various strategies to expand their global footprint and augment their market share. The key strategies followed by most companies in the Global Polyvinylidene Fluoride (PVDF) Market were expansion, merger and agreements. Arkema, 3M, DAIKIN INDUSTRIES, Ltd, and Solvay S.A are the key shareholders in this market. Most of them are adopting the expansion and collaboration tactic of their production capacities to strengthen their market position. Remarkable growth of end use industries, and continuous collaborations and agreements between manufacturers, distributers, and marketing firms are key factors operating in the Global Polyvinylidene Fluoride (PVDF) Market. Considering these trends, the Global Polyvinylidene Fluoride (PVDF) Market is poised to witness considerable competition over the forecast period of 2017-2023. October 2017- Arkema Inc. has introduced its Kynar 500® FSF® and Kynar Aquatec® polyvinylidene fluoride resins used in high-performance coatings, along with Bostik’s hurricane-resistant adhesive products, at METALCON 2017. This is expected to fulfil growing need for the PVDF coatings in automotive industry. November 7, 2017- The Belgian chemical company, Solvay S.A. has opened a new production facility for its Solef branded polyvinylidene fluoride (PVDF) in China, to meet growing demand for the thermoplastic polymer in energy-efficient, environmental and industrial applications. October 2015- Arkema, a specialty chemicals and advanced materials company, based in France introduced the new high performing Kynar Flex® grade for the wire and cable market. This unique grade of fluoropolymer has similar high performance properties to current wire and cable grades, such as chemical resistance, UV resistance, abrasion resistance and low coefficient of static and dynamic friction. Arkema (France), 3M (Germany), DAIKIN INDUSTRIES, Ltd (Japan), Shanghai Sanai Fu New Material Co., Ltd. (China), Solvay S.A (Belgium), Ofluorine Chemical Technology Co.,LTD. (China), KUREHA CORPORATION (Japan), Zhejiang Fotech International Co.,Ltd. 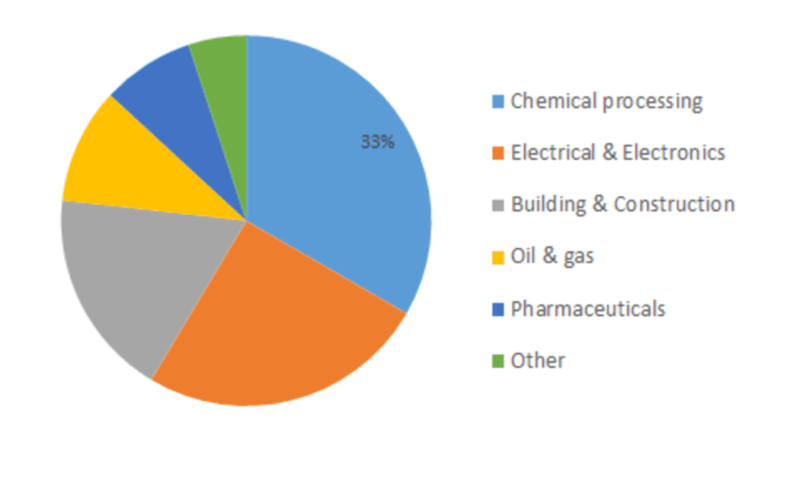 (China), the Quadrant group of companies (Japan), and ZHUZHOU HONGDA POLYMER MATERIALS CO.,LTD (China), among others are some of the prominent players at the forefront of competition in the Global Polyvinylidene Fluoride (PVDF) Market and are profiled in MRFR Analysis. PVDF is an engineered polymer synthesized by polymerization of Vinylidene Difluoride. It is used in numerous applications wherein greater purity, resistance to inorganic and organic solvents, acids and bases are the desired properties. PVDF finds applications into vast number of industries such as chemicals, electronics, new energy, construction, and pharmaceuticals, among others. Apart from these applications PVDF is significantly used in piping & tubing, sheets & films, membrane, cable, and an insulator for premium wire. The major characteristic feature of PVDF when compared to other Fluoropolymers, such as Polytetrafluoroethylene (Teflon), is a low density and light weight, which makes it useful in construction and automotive sector. The primary factor driving growth of the market is increasing demand for PVDF in vast number of applications in vast end-use industries coupled with rising acceptance of PVDF is a major factor expected to drive growth of the market over the forecast period. Additionally, an increasing demand for lithium-ion batteries, coatings, sheets, and photovoltaic films is an important factor favoring the demand for the product in coming years. However, the threat of substitutes on account of rapid ongoing research in polymeric materials and growing environmental & health concerns regarding the product, which is more likely to invite regulations limiting its production. Nevertheless, rapidly increasing end use in new energy sector is poised to drive the market during the forecast period.